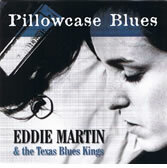 If you like good rocking blues you have it a-plenty here – but Eddie adds another colour or two to the usual palette. He takes his blues to the country and back to the town and has many a telling thing to say about life, love and the human condition along the way. This is perhaps Eddie’s most lively dance-around-the-house album yet.